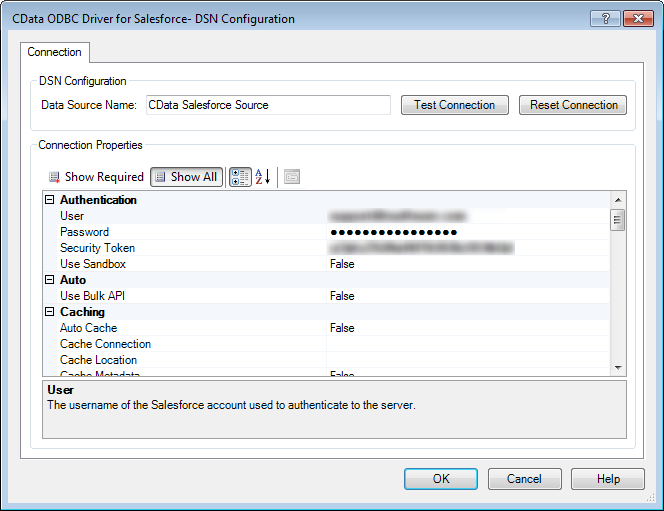 The CData ODBC Driver for Salesforce enables access to live data from Salesforce under the ODBC standard, allowing you work with Salesforce data in a wide variety of BI, reporting, and ETL tools and directly, using familiar SQL queries. 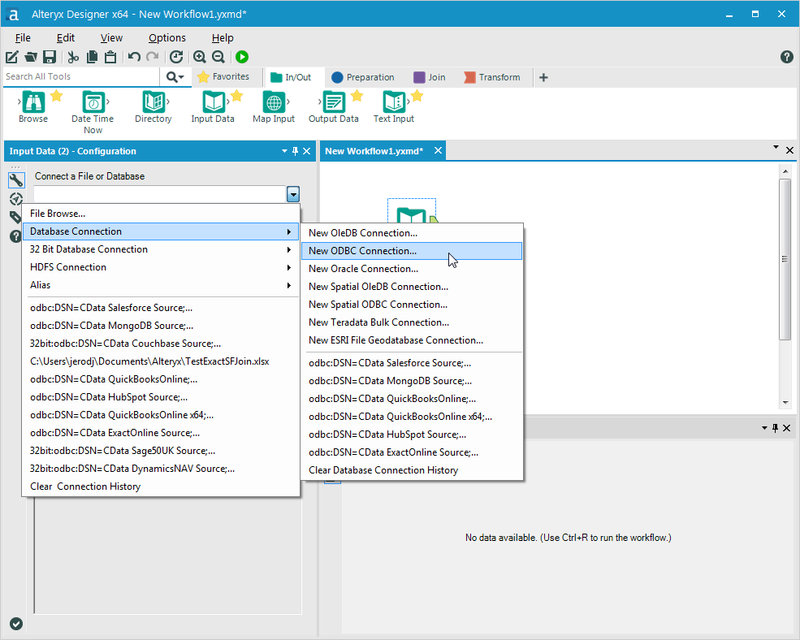 This article shows how to connect to Salesforce data using an ODBC connection in Alteryx Designer to perform self-service BI, data preparation, data blending, and advanced analytics. The CData ODBC drivers offer unmatched performance for interacting with live Salesforce data in Alteryx Designer due to optimized data processing built into the driver. When you issue complex SQL queries from Alteryx Designer to Salesforce, the driver pushes supported SQL operations, like filters and aggregations, directly to Salesforce and utilizes the embedded SQL engine to process unsupported operations (often SQL functions and JOIN operations) client-side. 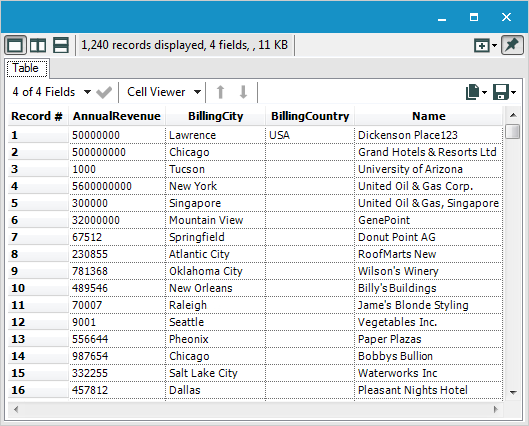 With built-in dynamic metadata querying, you can use native Alteryx data field types to visualize and analyze Salesforce data. 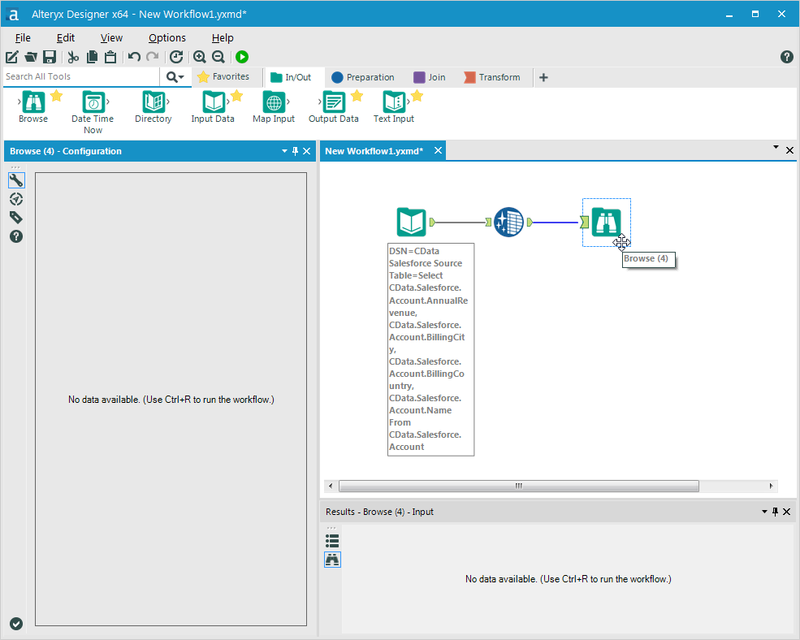 Follow the steps below to connect to Salesforce as an ODBC data source in Alteryx Designer. If you have not already done so, provide values for the required connection properties in the data source name (DSN). You can configure the DSN using the built-in Microsoft ODBC Data Source Administrator. This is also the last step of the driver installation. See the "Getting Started" chapter in the Help documentation for a guide to using the Microsoft ODBC Data Source Administrator to create and configure a DSN. SSO (single sign-on) can be used by setting the SSOProperties, SSOLoginUrl, and TokenUrl connection properties, which allow you to authenticate to an identity provider. See the "Getting Started" chapter in the help documentation for more information. 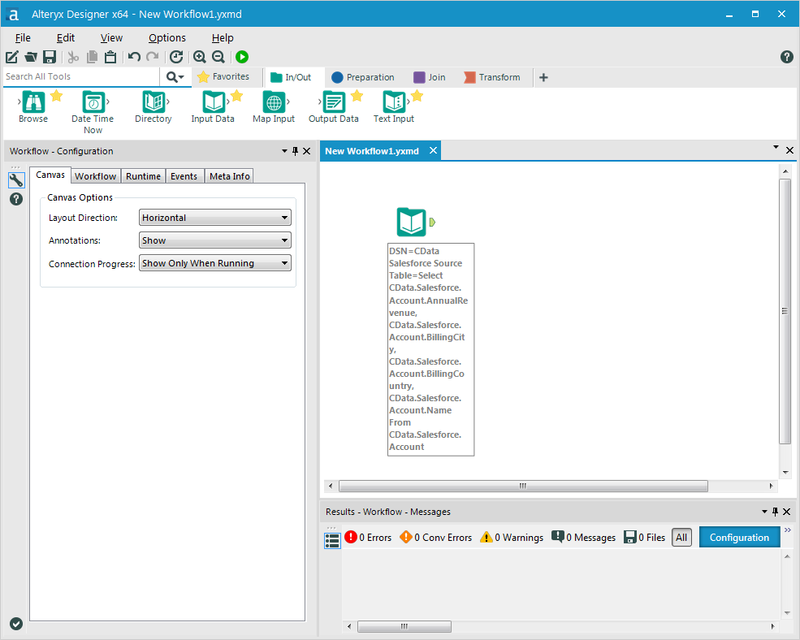 Open Alteryx Designer and create a new workflow. 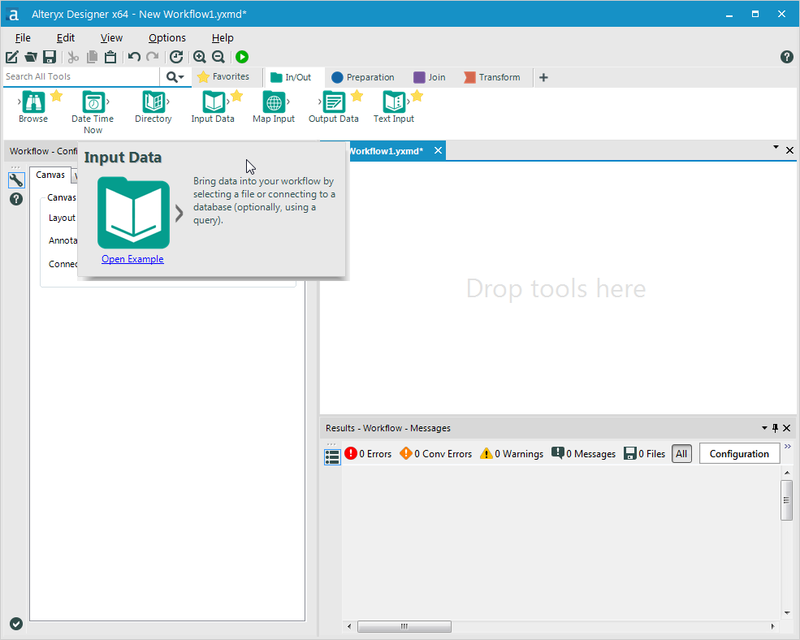 Drag and drop a new input data tool onto the workflow. Click the new input data tool and under Connect a File or Database, select Database Connection -> New ODBC Connection. 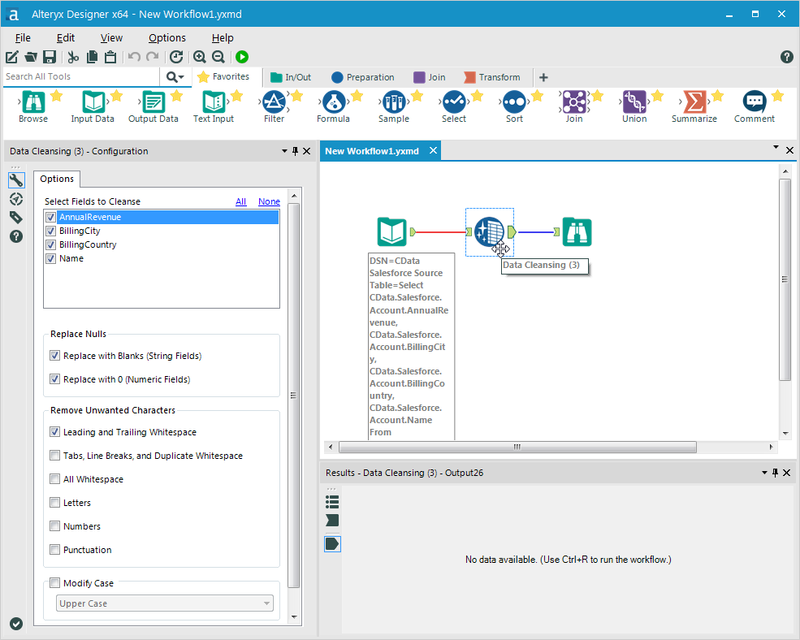 Select the DSN that you configured for use in Alteryx. In the wizard that opens, select the fields you wish to include in your query. Where possible, the complex queries generated by the filters and aggregations will be pushed down to Salesforce, while any unsupported operations (which can include SQL functions and JOIN operations) will be managed client-side by the CData SQL engine embedded in the driver. 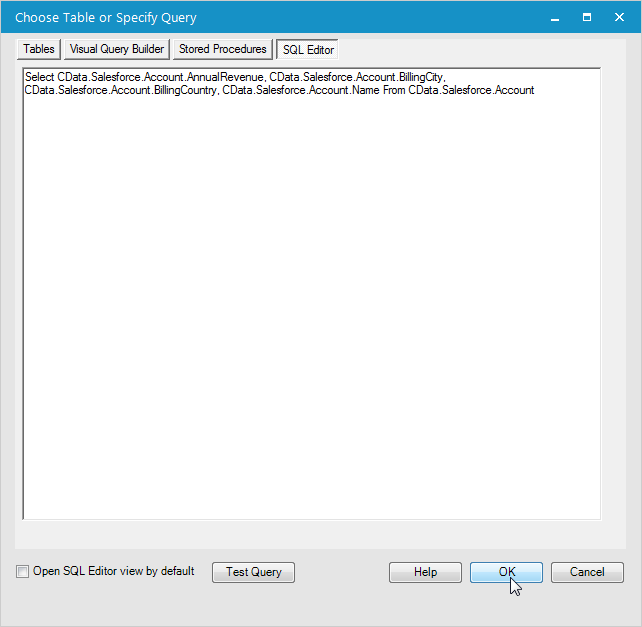 If you wish to further customize your dataset, you can open the SQL Editor and modify the query manually, adding clauses, aggregations, and other operations to ensure that you are retrieving exactly the Salesforce data you want. 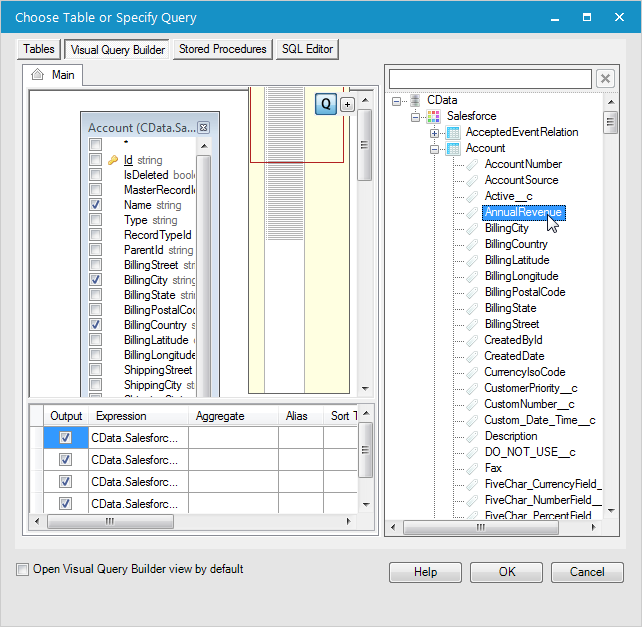 With the query defined, you are ready to work with Salesforce data in Alteryx Designer. You are now ready to create a workflow to prepare, blend, and analyze Salesforce data. 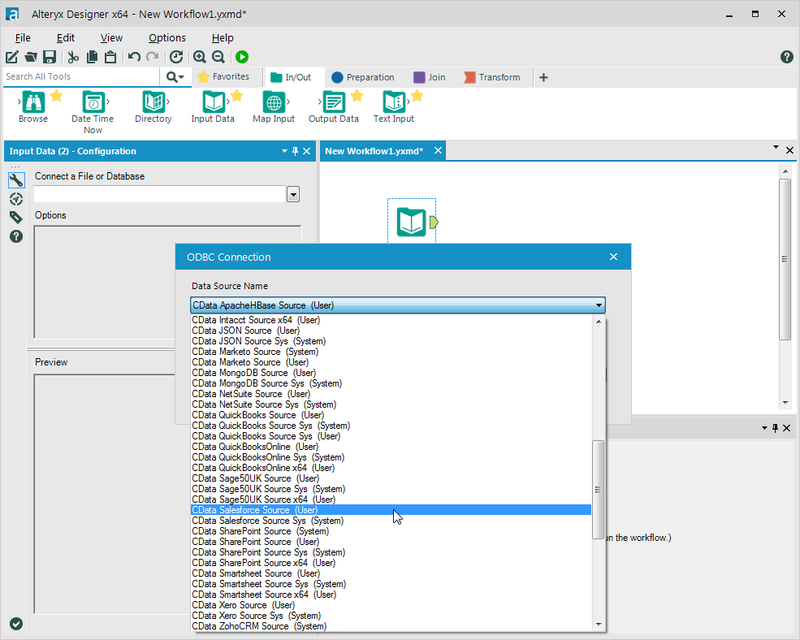 The CData ODBC driver performs dynamic metadata discovery and presents data using Alteryx data field types, allowing you to leverage the Designer's tools to manipulate data as needed and build meaningful datasets. In the example below, you will cleanse and browse data. Add a data cleansing tool to the workflow and check the boxes in Replace Nulls to replace null text fields with blanks and replace null numeric fields with 0. You can also check the box in Remove Unwanted Characters to remove leading and trailing whitespace. Add a browse data tool to the workflow. Click to run the workflow (CTRL+R). Browse your cleansed Salesforce data in the results view. Thanks to built-in, high-performance data processing, you will be able to quickly cleanse, transform, and/or analyze your Salesforce data with Alteryx.